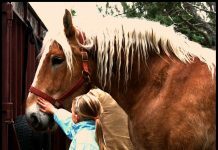 Here in the United States, there has been a great deal of press on the plight of horses abandoned, neglected and surrendered to rescues in the wake of economic recession. However, even at the low point of the economic crisis, North American horses still fare better than many equines in third-world nations. In most of the western world, horses are now luxury animals kept as pets or for recreation. In other countries, equines are still used primarily as pack animals, working long days in areas where veterinary care is inadequate or non-existent. Though people depend on horses for their livelihood, the welfare of animals is not a primary concern when their owners are struggling to feed their families. Additionally, there is often a lack of education and resources for proper horse care in impoverished areas. 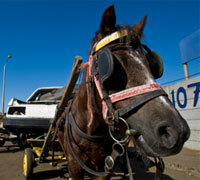 Several charities are working specifically to improve the lives of working equines and their owners around the globe. The Brooke is a UK-based organization dedicated to improving the lives of working horses, donkeys and mules in poverty stricken nations. The group’s primary project is to bring mobile vet and animal caretakers to third world countries in Asia, Africa, Central America and the Middle East. According to their website, the Brooke has reached over 730,000 equines with a goal of helping over 2 million by 2016. The Brooke assesses the areas in which they work to identify the most pressing welfare needs. The organization’s teams provide free veterinary care for working equines in poor communities. More importantly, they work with local animal owners to teach them ways to properly care for their equines. After The Brooke has intervened in an area, the organization will evaluate the effect their intervention has had on animal welfare in that area. This helps ensure that they are taking the correct steps for the specific communities in which they work. Keeping working horses and donkeys healthy not only helps the equines, but benefits the owners who depend on them for their livelihood. In the United States, the Brooke is represented by American Friends of the Brooke. Read more on The Brooke’s website. Safe Haven was founded by Lucy Fensom after she discovered the terrible conditions under which donkeys lived during a trip to Jerusalem. After purchasing a severely injured donkey in Israel and transporting him to an English sanctuary, Fensom opened a permanent refuge center in Israel where abused, injured and unwanted donkeys could live out their lives peacefully. Besides being overworked, donkeys are often left to die if they are injured or no longer able to work. Reports of stray donkeys tortured or killed by youths are not uncommon, and they are afforded no real protection from such treatment. One of Safe Haven’s goals to expand education programs to change the local attitude toward these beasts of burden. Save Haven’s Veterinary Outreach Project is dedicated to building resting stations where owners can bring working equines for wound care, dentistry and farrier service. A mobile station travels to more remote towns and villages to provide the same services. The WSPA has a variety of welfare initiatives that cover all types of animals, from companions to livestock to wildlife. The Society’s working equine projects cover impoverished areas across the globe. In parts of Latin America, Africa and the Middle East, WSPA partners with locals to provide veterinary care for equines while teaching owners proper nutrition and hoof care practices. The WSPA is also involved in helping animals after natural disasters, such as the earthquakes that hit Haiti and Chile earlier this year. Animals that survive the initial disaster may be left homeless or abandoned in the aftermath. WSPA mobile units deliver food, water and first aid to horses and other animals following catastrophic events. Temporary shelters care for animals until they can be reunited with their owners.